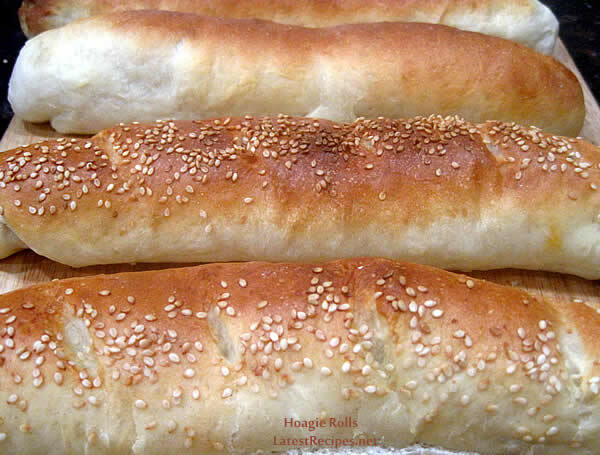 Delicious rolls, it takes time and patience but it’s worth it! Nothing beats the aroma and taste of freshly baked bread. This is perfect for meatballs sub and hotdogs/sausage sandwiches. Combine all ingredients adding just enough water to make a soft dough. Cover dough and allow it to rest for at least 1 hour (or double its size). Punch down dough and divide into six pieces. On a floured surface, roll out one piece into a rectangle then roll dough (from the long side) into a log and press the seam closed. Fold the ends under the log and place roll on a greased baking sheet (space them at least 2 inches apart). Preheat oven to 450 F and make sure there are two racks in the oven. On the lower rack, place a baking pan. Set a small pot of water to boil. When the oven is hot and the water is boiling, place the tray (or trays) inside the oven on the top rack. Before closing the door, pour the hot water in baking pan beneath the rolls. One Response to "Hoagie Rolls"